Craig Reid Taubman is an American singer/songwriter and music producer based in Los Angeles, California. Through his independent label/production office, Craig 'N Company, he has produced 11 albums. He is also the executive producer of the Celebrate Series, 12 Jewish-themed compilation albums with titles like Celebrate Hip Hop and Celebrate Passover. Taubman's career initially launched with his popularity as a children's recording artist in the early 1990s, during which he was prominently seen on the Disney Channel performing songs like "You Need a Haircut, You Really Need a Haircut" and concerts like "Rock'n Toontown" at Disneyland. In recent years, he has branched out into recording and performing more adult-oriented music, most of it Jewish in nature, although he continues to record and perform for children. 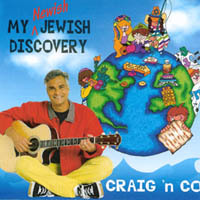 Through Craig 'N Co., Taubman regularly produces and performs at concert events across the country, most notably his regular Friday Night Live Shabbat evening services at Sinai Temple (Los Angeles, California), the Let My People Sing Passover Festival, and the Big Tent Event. In February 2013, Taubman bought the former Welsh Presbyterian Church on Valencia Street in downtown Los Angeles. Taubman announced plans to convert the building, which from 1909 to 1925 was the home of Sinai Temple and which was named a Los Angeles Historic-Cultural Monument in 1977, into "a multicultural and interfaith performing arts center and house of worship."